First the Question: Was the Roman centurion, of Luke 7:1-9, the only GENTILE man to received a blessing from Christ while on earth? Question: Not ONE of Israel's prophets knew, spoke, or wrote, concerning the “One New Man” of Eph. 2:15. True or False? It was wonderful to hear from so many of you about how much you all enjoyed and were edified by part one, and part two of “Super Bible Facts for Super Bible Study”. Now, before we move along to part three and the next 10 Super Bible Facts for Super Bible Study, I want to point out once again that it is super important for you all to become fully aware that the messages from the first chapter of Matthew to the last chapter of Revelation FIVE different groups or classes of people are addressed. For an in-depth explanation of these five different groups I urge you to read “Super bible Facts for Super Bible Study, part 1”. Keep these five different groups in mind, and you will derive both blessing and benefit as you carefully study this second set of 10 Super-Facts, (we added 2 BONUS Facts for this message, SURPRISE). 1) The “Law” Dispensation was both parenthetical and TEMPORARY. Galatians 3:19, Hebrews 8:7-13. The Law, which was contrary to man, was nailed to the cross. Colossians 2:14. 2) In the first eleven chapters of Genesis we have the record from creation to the call of Abram, about 2100 years. Israel was Abraham's grandson. About 70 souls out of the loins of Jacob (Israel) went to Egypt about 1900 B.C. More than one million Israelites came out of Egypt about 1500 B.C. Exodus 1:5, and Exodus 12:37. 3) The period from the sin of Adam to the time God made the Sinai Covenant with Israel, is called, “from Adam to Moses,” “when there is NO law.” Romans 5:12-14. Remember also, that there were no Israelites before the flood. Abel, Seth, Enoch, Noah, Shem, and Eber were not Israelites. But the Israelites were “Eberites,” and “Shemites.” The Jews are still called the “Semitic” people. 4) From Genesis 12:1 to Malachi 4:6, there are 926 chapters. With the probable exception of Job, and some of Proverbs, they all deal with the one Nation Israel. The other nations spoke of are only those nations that have dealings WITH Israel. All of the 39 Books, from Genesis to Malachi, were written by Jews. Read Romans 3:1, and Romans 9:4-6. If Luke was a Jew, then the 27 Books of the New Testament were written by Jews. 5) “The times of the Gentiles” politically, or governmentally, began about 600 B.C. (Jeremiah 50-52.). “The times of the Gentiles” spiritually, began when God sent temporary blindness upon Israel and the Risen LORD Jesus Christ sent the Apostle Paul to the Gentiles with the Ministry of Reconciliation. 6) The Spirit of Christ was in the Old Testament prophets and testified beforehand the sufferings of the LORD Jesus Christ, and the glory that should follow. 1 Peter 1:11. In Genesis 3:14-16, BEFORE the Old Testament existed, Christ was to be the Seed of the woman; in Malachi 3, “the LORD Whom ye seek.” In Isaiah 7:14, Christ was to be the LORD AND the Seed of the woman. Fascinating stuff! 7) All of the prophets “SINCE the world began” spoke of the restitution of all things (the millennium or the coming kingdom age). Acts 3:21, and Acts 3:24. When that time arrives the twelve apostles will be sitting on twelve thrones judging the twelve tribes of Israel. Matthew 19:28. Note the words of the LORD Jesus Christ in Mark 1:14-15 and Matthew 4:17, why the Kingdom of Heaven was at hand. 8) The prophets foretold that Christ would be the Stone rejected by the builders. Matthew 21:42. Luke 20:17. Psalm 118:22. David wrote that Christ would be raised from the dead to sit on David's throne. Acts 2:27-32. Now, carefully note the prophecy of Amos in 9:11-15. Christ, here, is to build again the tabernacle of David, and save Israelites and Gentiles. This is the program of Acts 15:13-18. 9) The Old Testament Prophets foretold the resurrection of Christ. 1 Corinthians 15:4. Psalm 16:8-10. They foretold the time of Jacob's trouble, Israel's “tribulation.” Jeremiah 30:7. Luke 21:11. They prophesied “the tree” (Calvary), “the tribulation”, “the throne”, and “Gentile salvation.” In Abraham's seed all nations would be blessed. Note what these Scriptures foresaw when Abram was justified. Galatians 3:8. 10) The Old Testament Prophets prophesied that Christ would be a King on David's throne. Isaiah 9:6-7. Psalm 24. Ezekiel 34:23-24; Ezekiel 34:28-31, and Ezekiel 37:24. HOWEVER, the Old Testament Prophets never ONCE prophesied that Yahweh Yahuwshua, The LORD Jesus Christ, would be the Head of the Body of Christ. Ephesians 1:19-23. Believing Jews and believing Gentiles joined, without distinction, in the one Body of Ephesians 4:4-5 of which Christ is the Head was truth NOT known and NOT prophesied by Israel's prophets. And TWO BONUS SUPER BIBLE FACTS! 11) When the Old Testament Prophets foretold the salvation of Gentiles, many times it was concerning their salvation IN THE KINGDOM, in SUBJECTION to Israel, but NEVER concerning God's eternal purpose in Christ, as revealed in 2 Timothy 1:9-11 and Ephesians 3:8-11. The Apostle Paul preached to Gentiles many Divine truths about which Israel's prophets wrote and spoke, but he ALSO preached among them the unsearchable (unprophesied) riches of Christ. Ephesians 3:8. Read carefully 2 Timothy 1:9-11 and compare with the Apostle Peter's message to Cornelius in Acts 10:34-38. Here is a thought to keep with you: A love for religion, ritualism, or sectarianism, will keep a saint carnal just as much as a love of the world! First the Question: Not ONE of Israel's prophets knew, spoke, or wrote, concerning the “One New Man” of Eph. 2:15. True or False? Question: God cast away the Gentiles, right about the time Abram was called out. True or False? Once again the purpose of these articles is to put together for members of the Lion and Lamb Ministry, and whoever may happen to read this, “Super-Facts” to help you in your Bible Study. As stated in Super Bible Facts for Super Bible Study, part 1, I want to reiterate here, that you all become fully aware that the messages from the first chapter of Matthew to the last chapter of Revelation FIVE different groups or classes of people are addressed. For an in-depth explanation of these five different groups I urge you to read “Super bible Facts for Super Bible Study, part 1”. Now I believe if you will keep these five different groups in mind, you will derive both blessing and benefit by carefully studying this first set of 10 “Super-Facts. 9) Nothing is said about the SAB­BATH during the 2500 years between Genesis 2:2 and Exodus 16:23. God gave no SABBATH to Noah, Abraham, Jacob, and Joseph. Not one of these fathers was under the Law. Abram found rest in a Person, NOT in a day. Abram had the Faith in God but no God given religion. He was circumcised 24 years after he was justified by The Faith. More Super Bible Facts coming! The Pauline writings are directed to the Body of Christ Church and are the only ones that mention the Body of Christ. The Body of Christ Church consists of Jew and Gentiles equal. Without Distinction! In the Body of Christ Church the sign gifts were directed at Israel (1 Corinthians 1:22; 1 Corinthians 14:21-22). After judgment was pronounced on Israel (Acts 28:28), the signs and gifts were no longer a necessity (1 Corinthians 13:8-12). No recorded signs or physical miracles after the close of The Book of Acts. Take note at the absence of the signs or miracles in Phil. 2:25-28; 1 Timothy 5:23; and then in 2 Timothy 4:20. For the time of the LORD’s return for the Bride of Christ Church there are prophesied fulfilling promises to Israel (Acts 3:19-21; Zechariah 14:1-21; Daniel 9:25-27; Isaiah 59:20-21; and Romans 11:26-27). The Body of Christ Church where there is NO indication of Israelite priority or character of any kind. Both Jew and Gentile are combined, without distinction, baptized by the Holy Spirit into the Body of Christ. First the Question: God cast away the Gentiles, right about the time Abram was called out. True or False? Question: From the first chapter of Matthew to the last chapter of Revelation, there are FIVE different groups or classes of people that are addressed. True or False? As we take a short break from our 12 part series, THE GOSPEL OF JOHN....THE GOSPEL OF CHRIST, I wanted to put together for members of LLM, and whoever may happen to read this, what I believe are Super-Facts to help you in your Bible Study. Now, before we can present the first in this series on Super-Facts, you all must become fully aware and learn of this very important fact…The Fact that from the first chapter of Matthew to the last chapter of Revelation FIVE different groups or classes of people are addressed. 3) To unsaved Gentiles who were aliens from the Com­monwealth of Israel, and not under the Law. The LORD Jesus Christ, was sent to Israel with a two-fold message; that is, to present “the Kingdom of Heaven” to the Nation with its rulers, and to offer salvation to individual Israelites. In Matthew 8:12, Christ called the Israelites, both saved AND unsaved, “the children of the kingdom.” In John 8:37 He said to the unsaved Israelites, “ye are the seed of Abraham.” In Acts 3:25 Peter addressed the unsaved Israelites as “the children of the covenant.” In Luke 1:16 and Luke 1:80 we read that John the Baptist appeared to Israel. In John 1:31 we read that John the Baptist baptized with water THAT Christ might be made manifest to Israel, (NOW you know why baptism was introduced, but this has NOTHING to do with the Body of Christ). In Acts 11:1-8 we learn that some of the twelve apostles contended with Peter be­cause he preached to an uncircumcised Gentile, about seven years after Christ died. From all of this and many other Scriptures, we should know the significance of the statement, in Romans 15:8, that Jesus Christ was a Minister of the Circumcision, and should know that, from Matthew 1:1 to Acts 11:18, God's order was “to the Jew only.” However, in Acts 11:18 we read that God did something for the Gentiles. Some of the messages in Matthew, Mark, Luke, John and Acts, were addressed to unsaved Israelites, or Jews, and some of them were addressed to saved Israelites or Jews. Surely we must consider this if we would intelligently interpret and apply these Scrip­tures, right? For, if we don’t we will just continue in the confusion that has resulted in all of the denominations of today. In applying the truth of Matthew, Mark and Luke, and the truth in the first nine chapters of Acts to Gentiles, whether saved or unsaved, we must keep in mind the particular group of people that is addressed in the Scriptures we are studying. Many messages which the LORD's servants proclaimed to backslidden Israel are not intended by God to be included in the salvation message of Christ for Gen­tiles, not under the Law. We should keep in mind the statements, concerning these Gentiles, in many different verses, for instance read the second chapter of Ephesians, as well as Ephesians 4:18. In these verses we learn that the Gentiles, to whom the Apostle Paul preached the Gospel of the Grace of God, were strangers from the covenants, aliens from the commonwealth of Israel, alienated from the life of God, and dead in trespasses and sins. Surely any preacher who preaches to such people, “bring forth meat for repentance,” the message which the LORD gave to John the Baptist for Israel, is out of the will of God. A dead man alienated from the life of God, could not bring forth fruit. But he could be made alive without doing anything. Ephesians 2:4-8. Romans 6:23. Ok, so, so far we have dealt with the first three classes of people… unsaved Israelites who were under the Law, saved Israelites who were under the Law before they became members of the Body of Christ, and unsaved Gentiles who were aliens from the Commonwealth of Israel, and not under the Law. Now, here are the fourth and the fifth classes. Now, you must keep in mind at all times, the saints in Corinth were just as much saints as were the saints in Ephesus. The difference was, the saints at Corinth were carnal and unable to take the strong meat which we find in the Apostle Paul's messages to the Ephesians and Colossians. Of course the “full-age” saints will feed on the milk as well as on the meat. But strong meat belongeth to saints of full age and carnal saints must limit themselves to a milk diet. A love for religion, ritualism, or sectarianism (denominations), will keep a saint carnal just as much as a love of the world. Read that sentence over and over again. The Corinthians were sectarians. The Ephe­sians and Colossians accepted the Divine Truth of Ephesians 4:3-6 concerning the One Body, the One Lord, and the ONE BAP­TISM. Now I believe if you will keep these five different groups in mind, you will derive both blessing and benefit by carefully study­ing these Super-Facts. The first ten Super Facts are coming up shortly. First the Question: From the first chapter of Matthew to the last chapter of Revelation, there are FIVE different groups or classes of people that are addressed. True or False? Question: Christ died for our sins, He was buried, and He rose again the third day, ACCORDING TO THE SCRIPTURES. True or False? With these statements concerning Israel’s unbelief and blindness, quoted from Isaiah 6:9-10, let us think of another prophecy concerning Israel’s rejection of their Messiah. We quote Psalm 118:19-24, “Open to me the gates of righteousness. I will go into them, and I will praise the Lord. This gate of the Lord into which the righteous shall enter. I will praise thee: for thou hast heard me, and art become my salvation. The Stone Which the Builders rejected is become the Head of the Corner. This is the Lord’s doing: it is marvelous in our eyes. This is the day which the Lord hath made: we will rejoice and be glad in it.” The Lord Jesus quoted part of this in Matthew 21:42. In Matthew 26:24 we have the words of the Lord Jesus, “the Son of man goeth, as it is written of Him.” Again we have His words in John 3:14, “as Moses lifted up the serpent in the wilderness, even so ‘must’ the Son of man be lifted up, that whosoever believeth in Him should not perish, but have eternal life.” (John 3:15). In Acts 4:25-29 we learn that the rulers of this world, who crucified the Lord of Glory (1 Corinthians 2:8), who killed the Prince of life (Acts 3:14-15), did none other things than God’s hand and God’s counsel determined before to be done. Let’s consider the statement in John 1:11, that Christ came unto His own and His own received Him not, together with Acts 13:29, “when they (Israel) had fulfilled all that was written of Him they took Him down from the tree and laid Him in a sepulcher”. “All that was written of Him”. In Matthew, Mark, Luke, and John, more than ninety times we read such expressions as, “that the Scriptures might be fulfilled,” “that the Word of the prophets might be fulfilled,” “as it is written” “it is written”…“all that prophets have spoken” (Luke 24:25), “all the Scriptures the things concerning Himself.” (Luke 24:27-44). When we say that Christ’s own received Him not and then read several times that many Jews believed on Him before His death and resurrection, and that thousands of His own received Him after His death and resurrection (Acts 2:41, and Acts 4:4, and Acts 5:14, and Acts 6:7, and Acts 9:42), we should know that John 1:11-13, like Romans 11:5-15, refers to something MORE than acceptance or rejection of Christ by individual Jews. John 1:11 should be studied with Acts 5:29-32 and Acts 13:46. And of course John 1:11 should be carefully and prayerfully studied with John 12:37-41, which should cause EVERY Christian to break forth with the Apostle Paul and say, “O the depth of the riches both of the wisdom and knowledge of God! How unsearchable are His judgments and His ways past‑tracing‑out! For who hath known the mind of the Lord? Or who hath been His counsellor?” (Romans 11:33-34). So as we read Christ’s statement in Matthew 26:24 and John 3:14 and this statement in John 12:27, “for this cause came I unto this hour,” let us think also of the statement in Acts 2:23, that God’s only Begotten Son was delivered by the determinate counsel and foreknowledge of God. The day on which the Lord Jesus Christ, Who knew no sin, was made sin, that believing sinners might be made the righteousness of God in Him (2 Cor. 5:21), the day on which God spared not His own Son but delivered Him up for us all (Romans 8:32) thereby providing “so great salvation” (Hebrew 2:3), was “the day which the Lord hath made”…“we will rejoice and be glad in it.” (Psalm 118:124). Some years after the Lord Jesus appeared once and put away sin by the sacrifice of Himself (Hebrews 9:26), and, by the Grace of God, tasted death for every man (Hebrews 2:9), the Apostle Paul said to the Jews in their synagogue, “Christ must needs have suffered, and risen again from the dead: and this Jesus Whom I preach unto you is Christ (Messiah).” (Acts 17:3). From what we have said we should better understand the words, “according to the Scriptures,” when we read in 1 Corinthians 15:1-4 that the Gospel, by which believing sinners are saved, is the truth that Christ died for our sins, was buried and rose again the third day. We are told in plain language, in Romans 4:23-25, that any sinner who believes God and receives Christ, believing that He (Christ) was delivered for our sins and raised again for our justification, will receive, by Faith….without works, the Divine, perfect, unimpeachable righteousness of the righteous God. First the Question: Christ died for our sins, He was buried, and He rose again the third day, ACCORDING TO THE SCRIPTURES. True or False? Question: There is NOTHING of the LORD Jesus Christ’s work in Samaria, like the woman at the well, etc., recorded in Matthew, Mark, or Luke. True or False? The Savior is called “Jesus Christ” in John 1:17; “Jesus,” the Lamb of God, in John 1:29. In John 1:14 Jesus is the “Incarnate Eternal Word.” So the Lord Jesus, in John, is “Emmanuel” and “JESUS”. In John 10:28-33 we find the religious people of His day trying their utmost to kill Him, with this charge: “Because that Thou, being a man, makest Thyself God.” Not only as a man did He make Himself God; but in the first chapter of John He is God who has been made Man. (John 1:1-2 and John 1:14). He is called by the single Name ‘JESUS’ about 250 times in John. At the end of the Book one of His Apostles worshipped Him, with “my Lord and My God.” (John 10:28). He was altogether worthy of this worship, for He testified that He had Glory with the Father before the world was. (John 17:5). “I and Father are ONE.” (John 10:30). In the Record of the life and ministry of the Lord Jesus Christ written by the Apostle John that Apostle did not call the Lord Jesus, “Savior.” Some people in Samaria, who came to Jesus through the testimony of the woman who met the Lord Jesus at the well, some who believed in Christ and were saved, said concerning Christ…“we have heard Him ourselves, and know that this is indeed the Christ, the Savior of the world.” (John 4:42). It is in John’s First Epistle that we find these words which the Holy Spirit directed John to write: “We have seen and do testify that the Father sent the Son to be the ‘Savior’ of the world.” (1 John 4:14). In John’s Record we find the words of Israel’s high priest in John 11:50-52: “Consider that it is expedient for us, that one man should die for the people, and that the whole nation perish not . . . he prophesied that Jesus should die for that nation (Israel) . . . and not for that nation only; but also that He should gather together in one the children of God that were scattered broad.” The Lord Jesus had said, in John 10:16, “Other sheep I have which are not of this fold: them also I must bring, and there shall be one fold (flock) and one Shepherd.” We know from subsequent events that the twelve apostles no more understood this saying of Christ than did Caiphas the high‑priest, understand what he said. Caiaphas was led to say in different language what John said, in 1 John 4:14, that the Father sent the Son to be the Savior of the world. Because the word ‘world’ is found about 77 times in John’s Record, this Message of John has been called by many “the universal Gospel.” In John 1:29, John the Baptist was led to say that Jesus was the Lamb of God who would bear away the sin of the world. The Apostle John, in 1 John 2:2, tells us that Jesus Christ is the propitiation for the sins of the whole world. In John 3:16 we read that God so loved the world that He gave His only begotten Son, that whosoever believeth in Him should not perish but have everlasting life. It is interesting to compare John’s statement, that the Father sent the Son to be the Savior of the world, with the statement of the Apostle Peter in Acts 5:31, that God raised Jesus from the dead to be a Prince and a Savior to give repentance TO ISRAEL and forgiveness of sins. Compare Acts 5:31 and 1 John 4:14 with the Apostle Paul’s statement to Israel, in Acts 13:23, that God raised up from David’s seed a Savior FOR ISRAEL, Jesus. We surely know there is a difference between Jesus sent to save Israel and Jesus sent to save the world. Many have been unable to reconcile Christ’s statement in Matthew 5:24, “I am not sent but unto the lost sheep of the house of Israel,” with John 3:16, “for God so loved the world that He gave His only begotten Son at whosoever believeth in Him should not perish but have everlasting life.” They prefer the statement in John 3:16 to the statements in Matthew 15:24 and Acts 13:23 and Acts 5:31. So they either ignore Christ’s words in Matthew 15:24 or think perhaps He did not mean what He said. As we compare Matthew 15:24 with John 3:16, let us consider this interesting fact, the fact that in Matthew 8:1-12, Matthew 15:21-27, Mark 7:21-27, and in Luke 7:3-12 we read that the Lord Jesus ministered to ONLY TWO gentiles of ‘great Faith’ while He was Jesus of Nazareth in the midst of Israel, in the land of the Jews. The woman was a very humble Greek. The man was a Roman, a centurion, who loved Israel and built for Israel a synagogue. This centurion asked the elders of Israel to present his urgent request to their Messiah. This story recorded in Luke 7:3-12 is most interesting. But what seems so strange is the fact that, although we find the word ‘world’ 77 times in John’s Record, there is no mention of the two Gentiles to whom we have referred. There were certain Greeks, in John’s Record who came to Jerusalem to worship, and said, “sir, we would see Jesus” (John 12:20-22). It seems that their request was not granted. The sum total of the ministry and witness of the Lord Jesus to Gentiles, recorded in John’s Gospel, is told in 1 Timothy 6:13, that Jesus Christ witnessed a good confession before Pontius Pilate. The saying of Jesus in John 4:48 seems to be proof that the nobleman of John 4:46 was not the Roman Gentile of Luke 7:1-10. In Matthew 10:5-7 we learn that there is a difference between Gentiles and Samaritans. In the John 4 we learn that Christ must needs go through Samaria, where He had a most fruitful ministry. NOTHING of Christ’s work in Samaria is recorded in Matthew, Mark or Luke. It was while the Lord Jesus was in Samaria that He was called “Savior” the ONE time in John’s Record. (John 4:42). In our previous study, “THE GOSPEL OF JOHN...THE GOSPEL OF CHRIST, part 4”, we mentioned the fact that the word “salvation” is found but ONE time in John’s Record; and that also is found in Christ’s statement to the woman at the well, in John 4:22, “salvation is of the Jews.” The word “righteousness” is found one time only in John’s Record. In John 16:10 we read that the Holy Spirit would reprove or convict the world of righteousness, because Jesus went to His Father. Not once in John’s Record do we find the words “justification,” “forgiveness,” “redemption,” “reconciliation” and “hope.” In the recorded ministry of the Apostle Paul these words, together with “salvation” and “righteousness,” are found more than 200 TIMES. In these words we have the great evangelical Christian doctrines. They are all IMPLIED in John’s Record. Surely all through the Message of John we find the all‑sufficient, abounding Grace in operation for any and all sinners who were willing to receive that Grace which came by Jesus Christ. (John 1:17). First the Question: NOTHING of the LORD Jesus Christ’s work in Samaria is recorded in Matthew, Mark, or Luke. True or False? Question: In relation to the Body of Christ, the LORD Jesus is NEVER called: Jesus of Nazareth or The Son of man. True or False? In the first chapter of John’s Record we read that the Lord Jesus is called, “The Word”. The Word was with God. The Word was God. The Word was the Creator of all things. 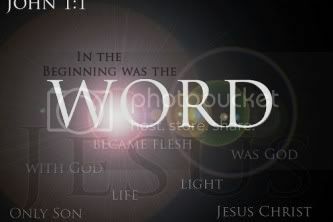 (John 1:1-3…John 1:10). Then we read in John 1:14, “The Word became flesh and dwelt among us.” In John 1:29 He is called ‘JESUS’ “The Lamb of God Who beareth away the sin of the world.” Then in John 2:19 the Lord Jesus predicts that He will raise His body from death or destruction. The truth of Philippians 2:5-11 is told, in different language, in the Epistles to the Hebrews. Note Hebrews 1:1-3 concerning the One, by Whom God made the worlds, “Who being the brightness of His glory, and the express image of His Person, and upholding all things by the word of His power, when He had by Himself purged sins, sat down on the right hand of the Majesty on high.” Note the Father’s words to the Son, in Hebrews 1:8, “Thy throne, O God, is forever and ever.” Then Hebrews 2:9; “We see ‘JESUS’, Who was made a little lower than the angels for the suffering of death, crowned with glory and honour: that He by the grace of God should taste death for every man.” He partook of flesh and blood, that He, through death, might destroy Satan’s death power. (Hebrews 2:14). In Hebrews 13:20 we read that God brought from the dead our Lord Jesus, that great Shepherd of the sheep. And we read in Hebrews 12:24 that believers have come to ‘JESUS’, the Mediator of the New Covenant. We read these words which the Holy Spirit directed the Apostle Peter to preach, in Acts 2:36, “let all of the house of Israel know assuredly that God hath made that same Jesus Whom ye have crucified both ‘LORD’ and ‘CHRIST’.” It is interesting to note that the title ‘LORD’, referring to Deity, is found more than 700 times in the New Testament Scriptures; that the word ‘CHRIST’ is found more than 570 times. It is likewise interesting to note the Apostle Paul, in His ‘ACTS’ ministry and in his fourteen Epistles, used the Name ‘JESUS’ about the same number of times the Name ‘JESUS’ is found in the twenty‑one chapters of John. There is this difference, however, in John’s Record the single Name ‘JESUS’ is used about 250 times without other titles; whereas in Paul’s ministry the single Name ‘JESUS’, without titles, is used only 22 times, eight of which are in Hebrews. There is a dispensational lesson for us in the first two times the apostle Paul used the single word ‘JESUS’; in Acts 13:23 and Acts 13:33-34. The Lord called Himself “JESUS OF NAZARETH” at the time Saul (Paul) was converted. (Acts 22:8). Then, just ONCE Paul called the Savior, “JESUS OF NAZARETH.” (Acts 26:9). The Apostle Peter called Him “JESUS OF NAZARETH” in Acts 2:22, and Acts 10:38. He called Him “JESUS CHRIST OF NAZARETH” in Acts 3:6 and Acts 4:10. Someone else called Him “JESUS OF NAZARETH” in Acts 6:14. The Saviour is called “JESUS OF NAZARETH” in John 1:45, John 18:5 and John 19:19. In Matthew, Mark, and Luke, He is called “JESUS OF NAZARETH” eight times. So in all of the New Testament Scriptures the Saviour is called “JESUS OF NAZARETH” twenty‑seven times. Now…It is significant that the Lord Jesus in His relation to His Body, the Body of Christ, is NEVER called “Jesus of Nazareth” or “The Son of man.” This may be explained in 2 Cor. 5:16. The title that ALL Christians should use today is the title used by the Apostle Peter in 2 Peter 1:11, “Our Lord and Saviour Jesus Christ”, or by the Apostle Paul, in Titus 1:4, “The Lord Jesus Christ, our Saviour.” The Apostle Paul called the Saviour, “Jesus Christ” and “Christ Jesus” more than 100 times. Perhaps, there is some reason why sometimes ‘Christ’ before Jesus, and other times ‘Jesus’ before Christ. Then many, many times Paul called the Saviour by the single title ‘Christ’, about 225 times. The total number of times the NAME ‘JESUS’ in the New Testament is about 977. First the Question: In relation to the Body of Christ, the LORD Jesus is NEVER called: Jesus of Nazareth or The Son of man. True or False? Question: In the Gospel of John, God is called....FATHER....122 times. True or False? Hear the words of the Lord Jesus in John 16:15, “All things that the Father hath are Mine.” Again His words to His Father in John 17:10, “And all Mine are Thine; and Thine are Mine.” Note again Christ’s words in John 5:19, “The Son can do nothing of Himself; but what He seeth the Father do: for what things soever He (the Father) doeth, these also doeth the Son likewise.” So the Son said, “no man cometh unto the Father but by Me.” (John 14:6). The Son proceeded forth and came from the Father, “neither came I of Myself, but He sent Me.” (John 8:42). It is interesting to note that John mentions the ‘FATHER’ in his five Books about 135 times. In the other 22 Books in the New Testament Scriptures the ‘FATHER’ is mentioned about 120 times. In the Apostle Paul’s messages God is called ‘OUR FATHER’ seventeen times, ‘THE FATHER’, sixteen times, “The God and FATHER OF OUR LORD JESUS CHRIST,” six times; twice ‘ABBA FATHER’, once each, “The FATHER OF GLORY,” “The FATHER OF SPIRITS,” “The FATHER OF MERCIES.” The word ‘FATHER’ is used about 66 times in Matthew, Mark and Luke, referring to God, the Father. In John’s Gospel God is called ‘FATHER’ about 122 times. Surely in John’s Gospel the Father is the God and Father of our Lord Jesus Christ. In John’s Gospel the Son calls God, ‘MY FATHER’ seventeen times; ‘THE FATHER’ sixteen times. He calls Him, ‘HOLY FATHER’ (John 17:11), ‘RIGHTEOUS FATHER’ (John 17:25). When the Lord Jesus said to His disciples in John 16:28; “I came forth from the Father, and am come into the world: again I leave the world and go to the Father,” the disciples told the Saviour that He was not speaking in proverbs, but “now speakest Thou plainly.” In John 14:10 the Son declared that the Father was dwelling in Him and working in Him. We think of the words of the Lord Jesus, at the age of twelve, when He asked His mother, “wist ye not that I must be about My Father’s business” (Luke 2:49)? Then His words the day of His agony in Gethsemane when He said to Peter, “put up thy sword: the cup which My Father hath given Me, shall I not drink it?” (John 18:11). The Son of God’s love testified in John 17:24 that His Father loved Him BEFORE the foundation of the world. He testified in John 10:17, “therefore doth My Father love Me, because I lay down My life, that I might take it again.” So the Lord Jesus was here on earth to be about His Father’s business and to drink the cup which His Father gave Him. We read several times in John’s Record that the Lord Jesus knew all things (John 21:17…John 4:25…John 2:25…John 6:64…John 16:30…John 13:1-3). In Colossians 2:3 we read concerning the Lord Jesus, “in Whom are hid all the treasures of wisdom and knowledge.” Therefore we may be sure that the Saviour knew that He was foreordained to be God’s spotless Lamb to bear away the sin of the world, and then be raised from the dead. (John 2:19). Between the day the Lord Jesus testified that He came to give Himself a ransom for many and the day the Apostle Paul wrote that Christ Jesus gave Himself a ransom for all, to be testified in due time (1 Timothy 2:4-7), great changes had taken place in God’s dealing with Israel and with the Gentiles. The RISEN Lord did NOT direct Paul to say very much about the sayings and doings of the Saviour during the years he was Jesus of Nazareth in the midst of Israel. Instead, Paul reasoned with the Jews right from their Old Testament Scriptures that Jesus was what Nathanael said about Him, “Rabbi Thou art the Son of God; Thou art the King of Israel.” (John 1:49). This we learn in Acts 9:20 and Acts 17:3. In Acts 20:35 the Apostle Paul quoted words spoken by the Lord Jesus on earth. In 1 Timothy 6:13 Paul declared that Christ Jesus, before Pilate witnessed a good confession. Several times the Apostle Paul spoke of the birth of the Saviour, which he mentioned in connection with His death and resurrection, but little or nothing of His sayings or doings in the land of the Jews as Jesus of Nazareth. Perhaps this is explained in 2 Cor. 5:16…When Paul urged Christians, not to please themselves, but others, he reminded them of Christ, Who “pleased not Himself; but, as it is written, the reproaches of them that reproached Thee fell on Me.” (Romans 15:3). As we diligently study John 1-21 we are reminded of Romans 8:3, “for what the law (the ten commandments) could not do, in that it was weak through the flesh, God sending His own Son in the likeness of sinful flesh, and for sin, condemned sin in the flesh.” The Lord said to His religious, ‘kingdom’ nation, “did not Moses give you the law, and yet none of you keepeth the law? Why go ye about to kill Me?”…“Do not think that I will accuse you to the Father: there IS one that accuseth you, Moses, in whom ye trust. For had ye believed Moses, ye would have believed Me: for he wrote of Me. But if ye believe not his writings, how shall ye believe My words?” (John 5:45-47). With these solemn words of the Son of God read the words which the RISEN Christ gave the Apostle Paul to speak to the religious Jews in their synagogue some years after Christ had gone back to heaven…“For they that dwell in Jerusalem, and their rulers, because they knew Him (Christ) not, nor yet the voices of the prophets which are read every sabbath day, they have fulfilled them in condemning Him; and though they found no cause of death in Him, yet desired they Pilate that He should be slain.” (Acts 13:27-28). Surely we understand more of the meaning of Psalm 119:126, “it is time for Thee, Lord, to work; for they have broken Thy law.” The law demanded righteousness, right living, right doing, right thinking. The Psalmist was saying, in different language, by the deeds of the law shall no flesh be justified in God’s sight. (Romans 3:20. Galatians 2:16). No child of Adam can earn righteousness. It's for your Web Browser, and it is now available for Internet Explorer, and Firefox! Stay up to date with LLM's Message for today, The LLM Daily Question, LionTUBE. You can also connect with Facebook, Twitter, and more! First the Question: In the Gospel of John, God is called....FATHER....122 times. True or False? Question: The LORD Jesus Christ in anticipating Calvary, called it His Baptism. True or False? The LORD Jesus would still say to religious, unsaved church‑members, “if God were your Father, ye would love Me: for I proceeded forth and came from God: neither came I of Myself, but He SENT Me.” (John 8:42). “Then said Jesus unto them, Yet a little while am I with you, and then I go unto Him that SENT Me.” (John 7:33). Less than four years was The LORD of Glory, the Creator of the heavens and the earth, in the midst of Israel, as Jesus of Nazareth, a Man approved of God by miracles and wonders and signs, which God did by Him. (Acts 2:22). But He finished the work which the Father gave Him to do. (John 17:4). Then said the Father’s Beloved Son to His Father, “Now I am no more in the world, I come to Thee.” (John 17:11-13). “O righteous Father the world hath not known Thee: but I have known Thee, and these have known that Thou hast SENT Me.” (John 17:25). In order to save the world God’s only begotten Son had to be lifted up on Calvary’s cross, and cry “FINISHED.” Was He tempted to pray to be saved from the agony of Calvary when He said, “shall I say save Me from this hour?” “But for this cause came I unto this hour?” (John 12:27). Then He said, “now is the judgment of this world.” (John 12:31). The Son came down from heaven to do His Father’s will. This meant Gethsemane and Calvary. When the LORD Jesus said, “now I go My way to Him that SENT Me” (John 16:5), He KNEW that He had to be lifted up, as Moses lifted up the serpent in the wilderness. (John 3:14). The LORD Jesus is indeed the Lamb of God Who beareth away the sin of the world. (John 1:29). Believing sinners are redeemed by the precious shed blood of this spotless Lamb, Who verily was foreordained before the foundation of the world. The shed blood of the Father’s Apostle is indeed ‘the pool of Siloam’. Unbelievers, religious and moral, or otherwise, must remain blind and unregenerated until they wash in that pool. “And THIS is life eternal that they might know Thee the only true God, and Jesus Christ Whom Thou hast SENT (apostello).” (John 17:3). In John 10:30 we have the testimony of the LORD Jesus, “I and my Father are ONE.” Note what followed: “The Jews took up stones to stone Him, because that Thou, being a man, makest Thyself God.” Now note John 5:17, the words of the LORD Jesus, “My Father worketh hitherto and I work.” Note what followed: “The Jews sought the more to kill Him, because He said also God was His Father, making Himself equal with God.” Again hear this testimony of Christ in John 8:58: “Before Abraham was I AM.” Note what followed: “they took up stones to cast at Him.” After repeated unsuccessful attempts to stone their Messiah to death the Jews said to Pilate: “it is not lawful for us to put any man to death.” (John 18:31). The reason the Jews could not stone Him to death was because THAT was NOT the Will of God. This is explained in John 12:32, “The Scripture saith, they shall look on Him Whom they pierced.” (Zechariah 12:10, Psalm 22:16, and Revelation 1:7). In all of these Scriptures and in the greatest story of the ages recorded in Philippians 2:5-11, the truth that Christ Jesus was first in the form of God and then took the form of man to become obedient unto the death of the cross, we think of Christ’s words in John 10:17, “therefore doth My Father love Me, because I lay down My life, that I may take it again.” In John 13:3 we read that Jesus knowing that the Father had given all things into His hands, and that “He was come from God and went to God.” So we can surely believe 1 John 4:14, that the Father SENT the Son to be the Savior of the world! As we read all of the twenty‑one chapters of John’s Gospel we see the truth of 1 John 4:14, just quoted, running all through the Book, and also the truth of John 1:18, “no man hath seen God at any time: the only begotten Son, Who is in the bosom of the Father, He had declared Him.” Yes, all through John’s Record the Son is revealing His Father, declaring God’s Grace and God’s love, and the truth that the Father and the Son are ONE. 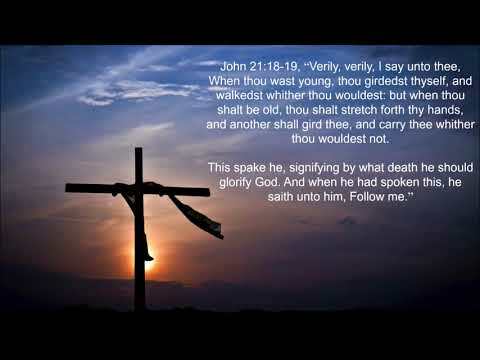 (John 17:22). Hear the words of the Son, Who was obedient unto death, Who always did the things that pleased His Father, “the cup, which My Father hath given Me, shall I not drink it?” (John 18:11). The Son’s meat was to do His Father’s will (John 6:38), “to finish the work.” (John 4.34). “The works which the Father gave Me to finish.” (John 5:36). “I have finished the work which Thou gavest Me to do.” (John 17:4). After the LORD Jesus had finished His prayer for His disciples He went with them to Gethsemane to be betrayed. In Matthew, Mark, and Luke, it is recorded that the obedient Son prayed to His Father in Gethsemane, “if Thou be willing, remove this cup from Me; nevertheless not My will but thine be done” (Luke 22:42, Mark 14:36, Matthew 26:42). But his prayer is not found in John’s Record. Christ answered His own question in John 12:27. His soul was troubled and He asked, “what shall I say? Father, save Me from this hour: but for this cause came I unto this hour.” Note again John 18:11, what the Son said when Peter cut off the ear of Malchus, “Put up thy sword; the cup which My Father hath given Me, shall I not drink it?” Christ did indeed drink that cup when He received His baptism on the cross. (Luke 12:50). When Christ told His Father, in John 17:4, that He had finished the work which His Father gave Him to do, the Savior knew that Gethsemane and Calvary were ahead of Him. Christ testified in Matthew 26:53 that He could call on His Father for sufficient angels to deliver Him; but He added: ‘How then shall the Scripture be fulfilled, that thus it must be.” (Matthew 26:54). ‘Thus it must be.” “Thus it is written and ‘Thus it behooved Christ to suffer’, and to rise from the dead the third day.” (Luke 24:46). About fifteen years later the apostle Paul said; “Christ must needs have suffered, and risen from the dead.” (Acts 17:3). Note the truth that follows the statement concerning Christ in Hebrews 10:9, “Lo, I come to do Thy will, O God”, “By the which will we are sanctified through the offering of the body of Jesus Christ once for all.” (Hebrews 10:10). Christ bare our sins in his own Body on the tree. (1 Peter 2:24). Thus we see the meaning of 1 John 4:14 and John 6:38, that the Father SENT the Son to be the Savior of the world; and the Son came down from heaven to do His Father’s will. The Father loved the Son from before the foundation of the world (John 17:24): and the Father loved the Son for going to the cross (John 10:17), where He, by the Grace of God, tasted death for every man. (Hebrews 2:9). Christ suffered on the cross for sins, the Just for the unjust, that He might bring us to God. (1 Peter 3:18). We read in Isaiah 53:10, “it pleased the LORD to bruise Him, and make His soul an offering for sin.” If this means that it pleased the holy, righteous God, according to His determinate counsel and foreknowledge, to have His only begotten Son put to death on the cross (Acts 2:23), then according to Christ’s words in John 8:29, it pleased that Son to be obedient unto death, it pleased Him to be bruised; for He said, “I do always the things that please Him (the Father).” (John 8:29). Christ died to save sinners, this is true, but He died to please the Father. We understand something of His agony in His words in Mark 14:34, “My soul is exceeding sorrowful unto death.” In Luke 12:50, as Christ anticipated Calvary, which He called His ‘baptism’, He was straitened till it was accomplished. After Christ bare our sins in His own body on the tree and His Father made His soul an offering for sin His body was buried in Joseph’s tomb. Then Psalm 16:10 was fulfilled, “For Thou wilt not leave My soul in hell; neither will Thou suffer Thine Holy One to see corruption.” So we read in Isaiah 53:9 of the ‘deaths’ of Christ. In Hebrews 2:14-15 and in 2 Timothy 1:10 we read that Christ, by His death and resurrection, destroyed Satan’s ‘death’ power and abolished death, and in the Gospel has brought to light, life and incorruptibility! It is by the resurrection of Christ from the dead that believers are begotten into a living hope. (1 Peter 1:1-3). In Romans 10:9 we are told that sinners are saved by confessing with the mouth Christ as LORD and BELIEVING in the heart that God raised Him from the dead. “This Man (Christ) after He had offered one sacrifice for sins forever, sat down on the right hand of God.” (Hebrews 10:12). We read in Ephesians 1:19-23 of God’s “mighty power which He wrought in Christ when He raised Him from the dead, and set Him at His own right hand in the heavenlies, above all power and might, and gave Him to be Head over all to the Church, Which is His Body.” In Ephesians 4:10 we read that Christ ascended far above all heavens, that He might fill all things.